We are huge fans of Kiddy, and have already shared how much we loved the Evolution Pro, the City'n'move and the Phoenix Pro so I was very excited when I found out about the launch of their new travel system. I was sent one to test and we love it. From the classy black frame, to the reversible seat to the ingenious raincover, I find this pushchair easy to use, light to push and comfortable for my babies. The Click'n'Move 3 comes in a variety of colours, and I went for the Cranberry as I am a huge fan of buggies that stand out. The colour is red bordering on pink but my boys can definitely pull it off. The seat can be both parent and world facing and is very easy to switch - using the two clips on the side it clicks out, can be turned and pushed back in. The seat unit is comfortable and a good size although my large toddler doesn't have much growing space left so I would have loved it to be ever so slightly bigger. The hood is large and has a viewing panel which is great for checking up on the boys when they are world facing. The bumper bar has a zip along it from which a raincover/ footmuff pulls out. I absolutely loved this feature as I find raincovers can be quite bulky in a basket and typically as soon as you forget one it starts raining! The cover is loose enough to let the child still kick their legs around, but the elastic means that they can't pull it off. The hood offers plenty of shade and so the child stays dry without having their face covered - perfect for toddlers who are not that keen on being covered up. I have wondered how well this would work in a storm but we haven't yet had to deal with that. I have discovered that the Kiddy raincover for their stroller does fit over this buggy though so I think we will use that if it comes to it. 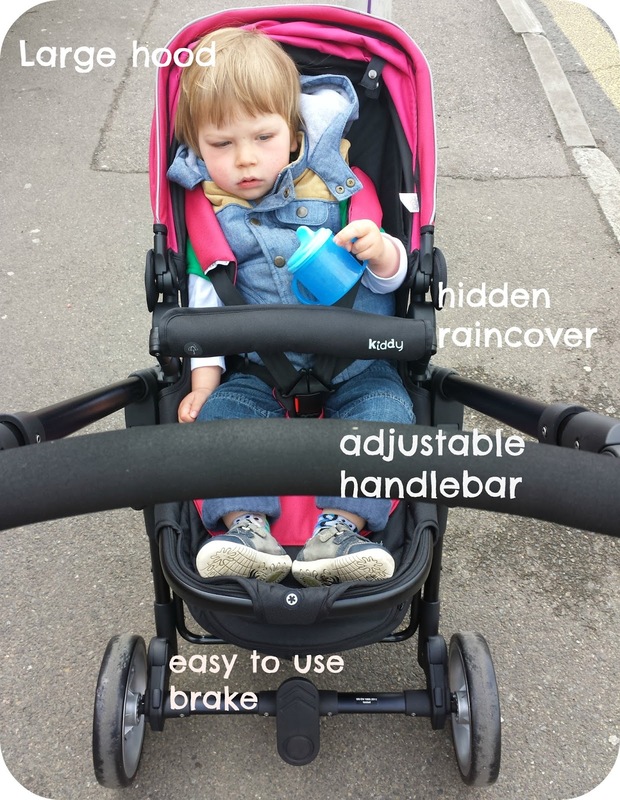 The handlebar is fully adjustable and suitable for parents or carers of any height as it goes low enough for a child to push and high enough for a very tall man to still be comfortable. 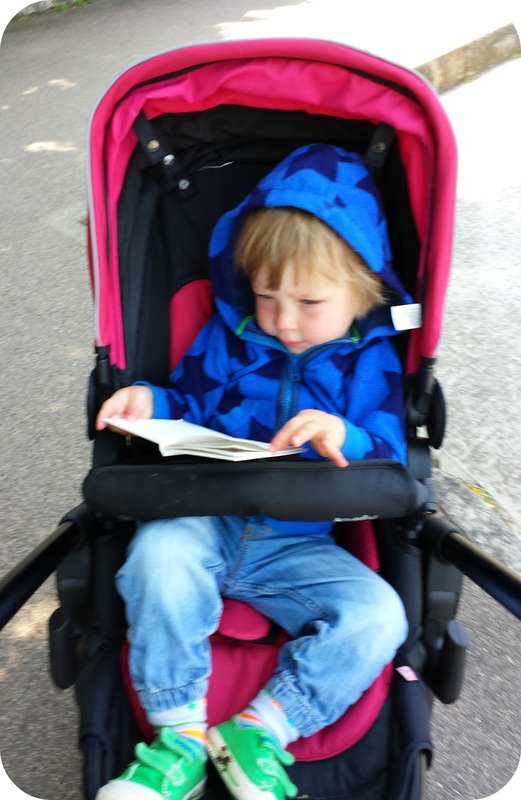 The steering is incredibly light, in fact one of my only criticisms of his pushchair is that sometimes I found it too light, even with a 15kg toddler in the seat. Generally this doesn't cause any problems though. The brakes are very handy and are activated easily by pushing down with your foot and pushing down on the other end to take them off. I have found this feature perfect for the summer as I often struggle with traditional stroller brakes in my flip flops. 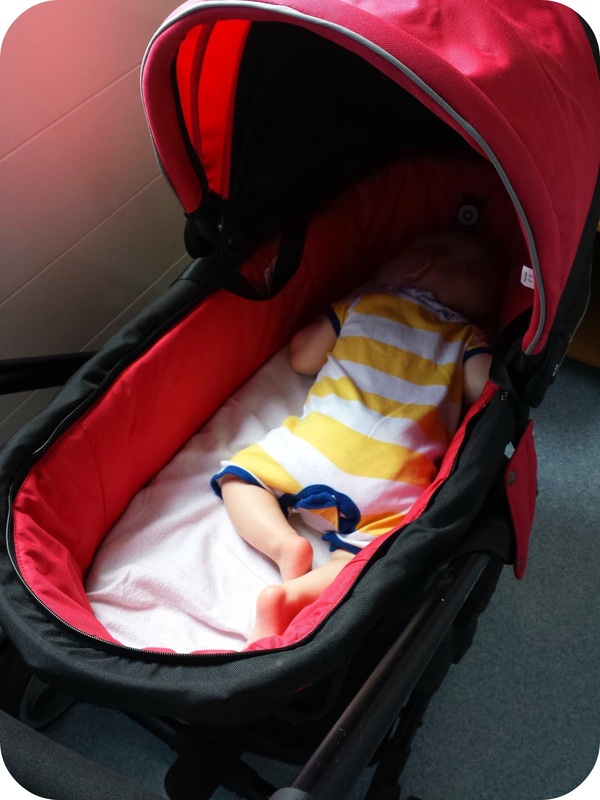 We were also sent the Carrycot for this pram which was invaluable during our hospital stay as it also doubled as Archie's bed some nights! As it happens, he slept better in there than he ever did at home so I think it is fair to say it got a thumbs up from him! The carrycot is traditional yet modern and looks great on the travel system. It was spacious enough for my long 5 month old to still be comfortable although by 5.5 months he was well and truly out of it. 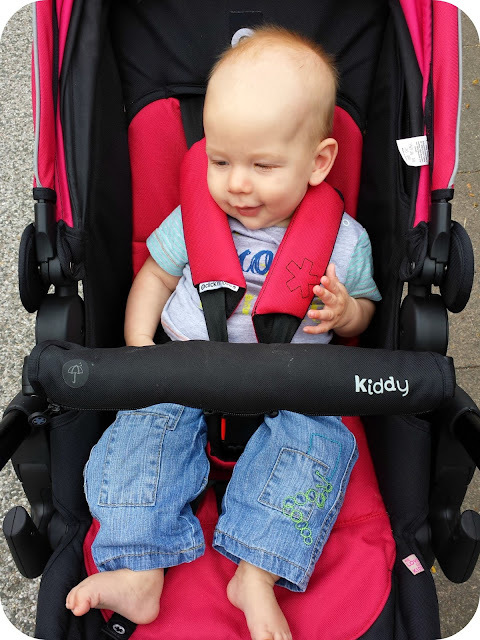 This travel system takes the Evolution Pro car seat which we love for so many reasons (you can read my review here) and I found it so useful when we needed to pop out from the car that (with adaptors on) the carseat could just slot in, and that Archie could lie flat as we walked. Overall we loved this travel system and have found it difficult to fault. I think it looks great, it is easy to push and both boys love using it. There is a great variety of colours and accessories and it is perfect from birth upwards. Disclaimer: We were sent the Click'n'move free of charge for the purpose of this review but all thoughts and opinions are completely my own.